ZF Aftermarket, supplier of Lemförder rubber-to-metal (RTM) components, explains their function and the importance of communicating the right information to your customers. They’re not visibly prominent and many drivers won’t even be aware of their existence, but rubber-to- metal (RTM) components play a vital role in vehicle dynamics and safety. On occasions, workshops may need to explain this to a customer when justifying the replacement of damaged or worn parts that remain largely unseen. 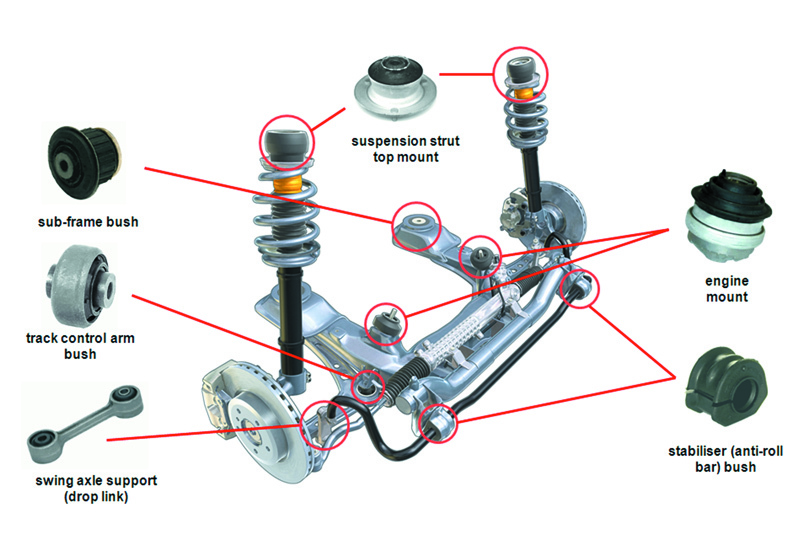 Take suspension strut and shock absorber top mounts as an example: in addition to preventing vibration and noise from intruding on passenger comfort, their condition directly affects steering, handling and braking characteristics. In simple terms, a rubber-to-metal component is a vulcanised rubber block bonded to metal (or plastic), used to join components or structures that must be isolated from noise and vibration – Fig 1 illustrates typical front axle locations. In practice, reaching an effective compromise between durability, safety and comfort involves many complex considerations when designing each individual RTM component to suit a specific vehicle model and purpose. This leads to unique rubber/additive recipes and product designs to tune dynamic properties, while also meeting requirements such as high fatigue strength, resistance to ageing, temperature resistance, and recyclability. For this reason it is recommended to always use replacement parts from an original equipment manufacturer such as Lemförder, as fitted at the factory by many vehicle manufacturers. Parts from other sources that appear visually identical may for instance be constructed with rubber of unsuitable characteristics, e.g. hardness, or simply glued together rather than chemically bonded during vulcanisation. Natural rubber comprises long polymer chains that can move independently of each other, allowing plastic deformation. To be suitable for RTM component construction it must be vulcanised to form an elastomer, which is both elastic and dimensionally stable. When making RTM parts, the rubber is also bonded to the metal substrate during the vulcanisation process. The metal is first primed, and then given a topcoat consisting of polymer solutions and other ingredients. The rubber/additives blend is then mixed with sulphur as a catalyst and moulded with the metal substrate under heat and pressure. During the vulcanisation process, the metal interacts with the primer, the primer with the topcoat and the topcoat with the rubber. A very high modulus layer forms in the rubber next to the substrate, yielding a strong bond of only 10 to 20 microns in thickness. Meanwhile, polymer molecules in the rubber form cross-links, reducing the ability of the polymer chains to move independently. This allows the rubber to deform under stress but return to its original shape when the stress is relieved. Shock absorbers must maintain tyre-to-road adhesion for good grip and braking. Worn top mounts reduce optimum tyre contact, resulting in longer braking distances and compromised handling, especially during critical avoidance manoeuvres. In addition, anti-lock braking and stability control systems can only function perfectly if all suspension components are in faultless condition. Worn top mounts impair ride comfort, generating noise and transmitting vibrations into the vehicle interior. They also create higher loads on new shock absorbers and other suspension components such as drop links, which then wear more rapidly. 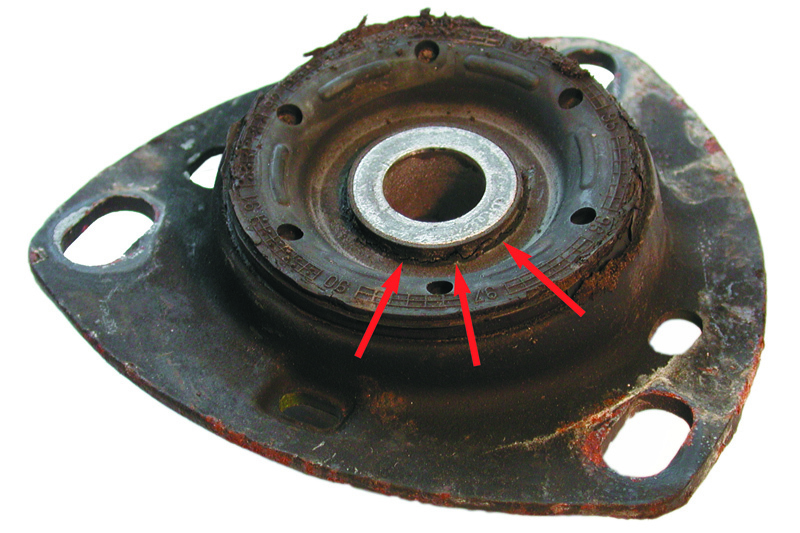 Wear in the top mounts may manifest itself through increased vibration, longer braking distances, or stiff/non-self-centring steering – symptoms that usually develop gradually and go unnoticed by the vehicle owner until a knocking noise prompts investigation. Where possible without dismantling, visual inspection may reveal folds or cracks in the surface of the rubber (Fig 2) or the rubber detaching from the metal. Following strut removal, a thorough examination can be made and the top mount height compared with a new item (Fig 3). Although elastomer rubber does tend to settle under a static load, for a component in serviceable condition the height difference should be less than 2 to 3mm. At each service inspection, workshops should visually check the condition of the top mounts and for wear symptoms during a test drive, advising customers of any suspected faults. ZF Aftermarket recommends that top mounts are renewed each time the shock absorbers are replaced to ensure that vehicle safety and performance are maintained. No additional time is involved as the mounts need to be removed and replaced anyway, so this practice also boosts profit margins. Like shock absorbers, top mounts should always be replaced in pairs.